At a Kremlin meeting of constructors in September 1951 Stalin insisted on sudden great advance in Soviet helicopters. On following day Mil and Yakovlev were given one year to design, build and fly prototypes, Mil’s assignment being single-engined 12-passenger machine. Mil had prepared outline design beforehand which he produced at Kremlin; basically scaled-up rotors of Mi-1 with added fourth main rotor blade, rotor axis inclined forwards 5 degrees, and a fuselage of light-alloy semi-monocoque with extensive use of magnesium. The engine installed at 25 degrees in the nose, accessible through upper/lower hinged nose doors and left/right hinged side doors. Cooling fan and centrifugal clutch immediately to rear of engine, with inclined shaft between pilots to main gearbox. Separate cooling systems for oil radiator and hydraulics for flight control. Straight tail boom with adjustable stabilizers, deep skid/bumper and narrow fin carrying tail rotor on right, with three bakelite-ply blades. Main fuel tank welded aluminium, 960 lit, behind gearbox; optional aux tank 500 lit in hold or externally. Quad landing gear with pneumatic-braked mainwheels and castoring nosewheels, optional pontoons for water. Main hold 4.15m long, about 1.8m square section. Max internal load 1740kg including small vehicles loaded through left/right rear doors and clip-on ramps. Slung load to 1.3t. Alcohol de-icing of blades and windscreens as on Mi-1. First flight delayed several weeks by blade flutter in ground-running from 14 April 1952. First flight May, Vinitsky assisted by Brovtsev. Remarkably few subsequent snags and NII testing completed before end of year. The Mi-4 was already in Soviet Air Force service by August 1953, when it was first seen publicly at the Tushino Aviation Day display. NATO code name ‘Hound’. At the 1953 Soviet Aviation Day Display, 18 flew, 13 unloaded jeeps through rear clamshell doors under their tailbooms. The others each unloaded two motor-cycle and sidecar combinations. Featuring a four-blade main rotor with hydraulic servo-control and three-blade anti-torque rotor at starboard side of tailboom. The main rotor blades were originally tapered, with steel spars and plywood covering; since 1961 they have been of constant-chord all-metal construction. All-metal semi-monocoque structure of pod and boom type, with access to the main cabin via a normal side door, with provision for clamshell doors under the tailboom attachment point in freight-carrying version. The landing gear is a non-retractable four-wheel type. All units fitted with shock-absorbers. Nosewheels are fully castoring. Spats optional. Provision for fitting pontoons. Power is from one 1,700hp ASh-82 V 18-cylinder air-cooled radial engine mounted in fuselage nose. Accomodation is for a crew of two on the flight deck, with underfuselage gondola for observer in military version. Commercial version carries 8 to 16 passengers in heated, ventilated and soundproofed cabin, with door at rear on port side. Aft of cabin are a toilet, wardrobe and compartment for 100kg of baggage. Ambulance version carries eight stretchers and attendant. Freight version has clamshell rear doors. Military version carries up to 14 troops, 1,600kg of freight or vehicles such as a GAZ-69 'Jeep', 76mm anti-tank gun or two motorcycle/sidecar combinations. Radio and instrumentation for night and bad weather flying are standard equipment. A liquid leading-edge de-icing system. Produced initially since about 1953 for use by the Soviet armed forces in assault and troop transport roles, the Mi-4 'Hound-A' has clamshell rear doors to simplify the loading of vehicles and freight; alternatively, the cabin can accommodate 3,520 lb (1,600 kg) of cargo, or up to 14 troops. 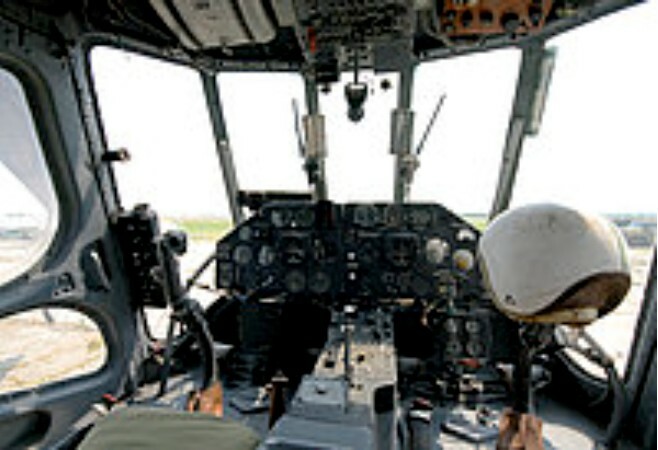 Military Mi-4s are recognisable easily by having a ventral gondola which was intended originally for a navigator or observer, but can also house avionics equipment. Produced in large numbers for Soviet military use, the Mi-4 was also exported for service with more than 20 foreign air arms. Conversions have been reported in Soviet use for ASW ('Hound-B') armed close support and ECM ('Hound-C'). From 1964 production of civil versions was initiated and combined civil/military production by Mil was estimated at 3,500 when production terminated in 1969. All versions can be equipped with inflatable pontoons which, mounted so that the landing wheels project below them, can be used for amphibious operations. Urgent development of improved metal blades 1954-60 culminating in dural blade with extruded spar and honeycomb box trailing sections. Magnesium fuselage skins replaced by aluminium, and better flight control and avionics. Main production model military Mi-4T, with increased diameter main rotor, aluminium cargo floor, bulged circular windows with gun ports, ventral gondola for nav/observer, and tactical avionics. Military Mi-4's have been exported to a number of air forces in the Soviet bloc, among the largest users being India, which had sixty, and Cuba, which had twenty-four. A stripped-down Mi-4 established a number of speed-with-payload and payload-to-altitude records in April 1956, including 500km circuit at 187.254km/h, and later 1012kg lifted to 7575m. From 1964 civil versions of the Mi-4 were also built in considerable numbers. A basic Mi-4 for general use and freight transport followed by the Mi-4P (Passajirskii - passenger) and the Mi-4S (Selskokhoziaistvennii - rural economy). The Mi-4P is the standard version for Aeroflot, carrying 11 passengers normally or up to 16 in high density seating or, in the ambulance role, 8 stretchers and a medical attendant. The Mi-4P is distinguished by having square cabin windows, wheel spats and no ventral fairing; 100kg of baggage can be carried in addition to the normal passenger complement. The Mi-4P, which went into regular service with Aeroflot in November 1958, can carry up to 11 passengers or eight stretchers and a medical attendant for ambulance duties. 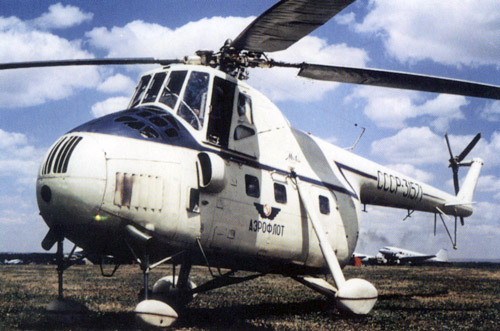 The Mi-4S (SKh) is normally used for agricultural operations, when it can be fitted with a 1000kg dust hopper or a 1600-l tank holding pesticide or fire-fighting chemical. First flown in 1962, the Mi-4PL ASW version for AV-MF carried four 250kg or six 100kg A/S bombs, chin radar (also fitted to various military variants), short but deeper gondola, and a towed MAD at rear and sonobuoys on external rack on right side. The Mi-4S Salon VIP version had a mtow of 7315kg. A small batch of Mi-4L (Lyuks, de luxe) six-seaters were built. Mi-4M tactical variant with gun turret and air/surface rockets 1968, and EW platform first seen 1977 with two pairs of lateral Yagi arrays and other aerials mainly for communications jamming. In Spring 1965, details were given of a series of high-altitude tests made with an Mi-4 fitted with two-speed supercharger and all-metal main rotor. After engaging the second speed at 4,650m, the aircraft climbed to 8,000m. It was also operated at an airfield height of 5,000m. The Mi-4 was also manufactured under licence in China from 1959 as the Harbin Z-5 (Zhishengji 5) with many changes. A total of about 545 were built when production ended in 1979, and of which approximately two-thirds were for civil use. Basic military version with underfuselage gondola for navigator. Production said to have started in 1952. Civil freight version is generally similar, with double clamshell rear-loading doors. Soviet films of military exercises, released in 1968, showed a close support version of the Mi-4, armed with a gun in the front of the underfuselage nacelle and air-to-surface rockets. Small batch of six-seat de luxe version; some equipped for medevac with eight stretchers and attendant. Civil transport version used extensively by Aeroflot and seating eight to 11 passengers in furnished cabin First flying prototype, 1955. Major use in ambulance configuration carrying up to eight stretchers and a medical attendant. Entered service on Aeroflot's Simferopol' to Yalta route in the Crimea in November 1958. This version has square windows instead of the circular windows of the military version and has no underfuselage gondola. The wheels are often fitted with spats. Basically an agricultural version with a large chemical container in the main cabin, but used also for fire-fighting operations Spread through bifurcated ducts by hydraulically actuated fan in duct which replaces the military ventral gondola. Liquids are sprayed from bars mounted aft of mainwheels. Rate of spread is up to 18 litres or 20kg/s, with swath width of 40 to 80m, at forward speed of 60km/h.